With devastating fires in Indonesia providing a backdrop for the destruction wrought by unrestrained plantation development, the Malaysian Borneo state of Sabah on Wednesday announced it is pressing forward with a plan to certify 100 percent of its palm oil production under criteria set by the Roundtable on Sustainable Palm Oil (RSPO) by 2025. The initiative aims to differentiate Sabah’s palm oil from other producers, while addressing environmental problems and boosting productivity of existing plantations as part of a broader push to shift toward a more sustainable and diversified economy. According to a declaration issued by the Sabah Forestry Department, the Sabah state government will provide technical assistance to implement the program, including group certification to small holders at no cost. Larger companies operating in concessions managed by the Forestry Department have already been given deadlines to get RSPO certification, which requires producers to adopt production safeguards that reduce environmental and social impacts of cultivation and production. Officials say the program will better position Sabah as other states and regions enter the palm oil business. Sabah accounts for 12 percent of global palm oil production, but expects to see that share fall with rapid plantation expansion in other parts of Asia, Latin America, and Africa. The plan puts Sabah on track to become the first state to fully adopt certification for all of its producers. Advocates say the so-called “jurisdictional approach” could be an effective way to reduce risks in commodity supply chains by creating “safe” markets for buyers while also cutting transactions costs associated with certifying each individual plantation or farm. The approach operates on the premise that producers in a jurisdiction would pressure non-compliant peers to come into compliance for fear of losing certification for the entire group. Monitoring would help ensure producers are abiding by the rules, while higher margins from higher prices and yields would provide them an additional incentive to participate. The certification program is a central component of Forever Sabah, a multi-stakeholder initiative that endeavors to transform Sabah’s economy. Forever Sabah envisions going well beyond the palm oil sector, including establishing wildlife corridors, restoring forests degraded by logging, and setting up new protected areas. The initiative includes programs to foster polyculture and agroforestry, community-based ecotourism, and more responsible stewardship of marine resources. Young orangutan orphaned by the palm oil industry when its mother was killed in a plantation in Central Kalimantan. This orangutan was one of the lucky ones — it ended up in a rehabilitation center rather than dying of starvation or being sold into the pet trade. Photo by Rhett A. Butler. 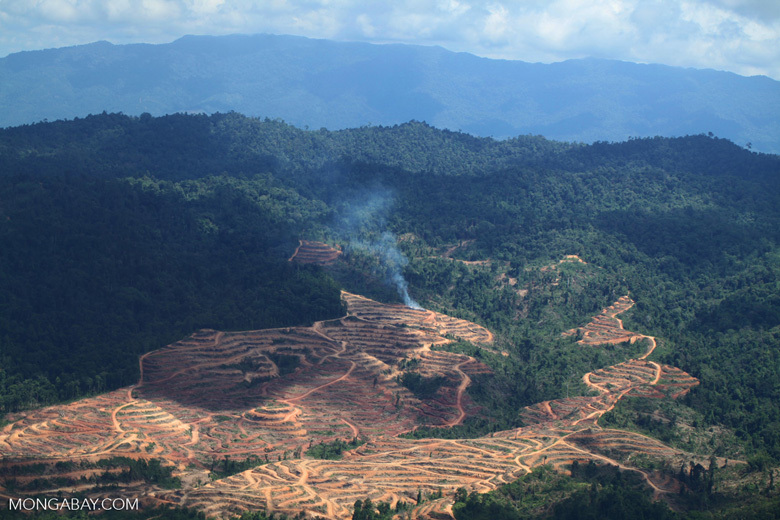 Palm oil production has had a substantial impact in Sabah: roughly a fifth of the state’s land mass has been converted to plantations, including areas once covered by biologically-rich lowland forests that house endangered orangutans, clouded leopards, and pygmy elephants. However the state still retains significant blocks of healthy forest, providing hope that curbing further destruction and restoring corridors of habitat could help ensure a future for wildlife. Due to its high yield which makes it a cheap source of vegetable oil, palm oil is widely used as a cooking oil, a fat in processed foods like cookies and crackers, and an ingredient in cosmetics and cleaning products. 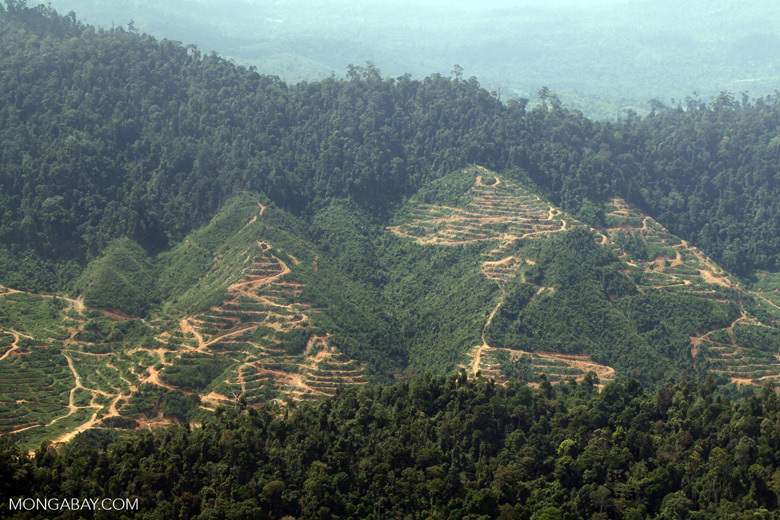 The world produced 54.3 million metric tons of palm oil in 2013. Indonesia accounted for roughly half of that production, while Malaysia came in about 35 percent. Human-wildlife conflicts could potentially be reduced with the introduction of fully certified palm oil for Sabah. Photo shows an elephant stranded in a smallholder’s farm. Photo and caption courtesy of LEAP.